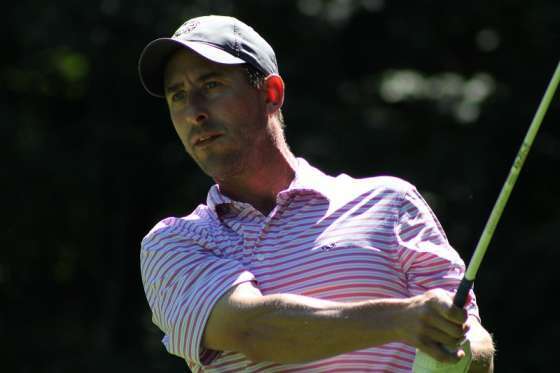 HARBOR SPRINGS – Anthony Sorentino of Shelby Township successfully defended his title in the 34th GAM Mid-Amateur Championship Friday beating six-time champion Tom Werkmeister of Grandville with a birdie on the first sudden-death playoff hole. Sorentino, a 38-year-old assistant prosecutor in Macomb County, hit a 9-iron shot to seven feet on the playoff hole (No. 18 Ross Memorial Course) and made the putt for the win. Werkmeister had already missed his birdie attempt from 35 feet. It was a third Mid-Am title for Sorentino in the 36-hole event for golfers over age 25. He beat one of his best friends, John Quigley, in a playoff last year, and in 2006 topped Randy Lewis of Alma in a playoff for his first title. “It always feels good to win, and I can’t believe how I got in the playoff,” Sorentino said. He made a double-bogey 6 on 18 on the Ross course in regulation play with a poor drive and greenside bunker troubles. If left him at even-par 71 and a 138 tournament total. Werkmeister, meanwhile, shot 67 with a par on 18 in regulation to set up the playoff at 138. Sorentino, who started the day with a four-shot lead on Werkmeister, hit 3-wood off the tee in regulation to stay short of the pond on 18. He went with driver in the playoff and hit it perfectly up the left side. Werkmeister, meanwhile, hit his tee shot on the right side of the fairway and played away from the pond-protected flag. Andy Matthews of Ada and Andrew Tindall of Chelsea were next behind the playoff participants at 143. Matthews shot 71 and Tindall a 68. Jud Kotas of Grosse Pointe Farms, who shot 71, Scott Jaschuk of Milford, who shot 68, and Jason May of Oakland, who shot 68, tied at 144. Kotas won the Mid-Seniors trophy for golfers 45-and-over. The field was split in half, with Seniors (over 55) and Super Seniors (65-and-over) playing the Hills Course for the final round. Jeff Knudson was the Senior champion after shooting a 72 for 144. He beat Ron Perrine of Holt by one shot. Perrine had a 75 to close. Greg Reynolds of Grand Blanc was the Super Senior winner for the second consecutive year. He shot 71 for 147. Complete results for the field of 165 golfers can be found at www.gam.org under the Championships tab.